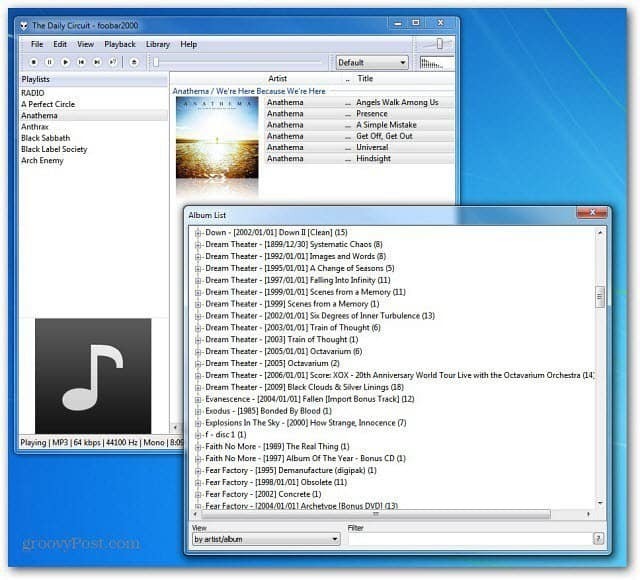 If you’re sick of using iTunes to manage your music collection, try the free and light Foobar2000 music player. It’s fully customizable with plugin components. It loads up faster than iTunes and is light on system resources. 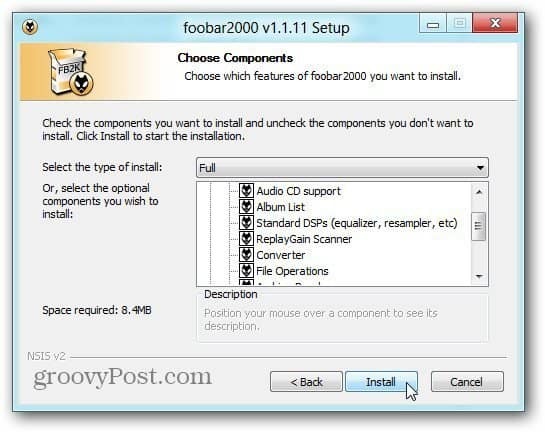 First download and install the latest version of Foobar2000. It supports XP SP2, Vista, Windows 7, Server 2003 and Server 2008 – I was able to use it on Windows 8 successfully too. Select the components you want to install…here I’m doing a full installation. 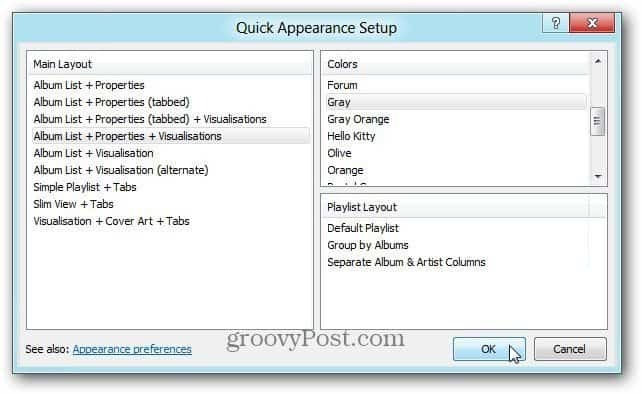 It installs quickly and when it’s ready, you’ll see the Quick Appearance Setup. Choose any combination you like. You can move the Quick Appearance Setup screen and see how the player will look. Don’t worry if you don’t like any of the layouts, you can skin it later. Now add you music collection. 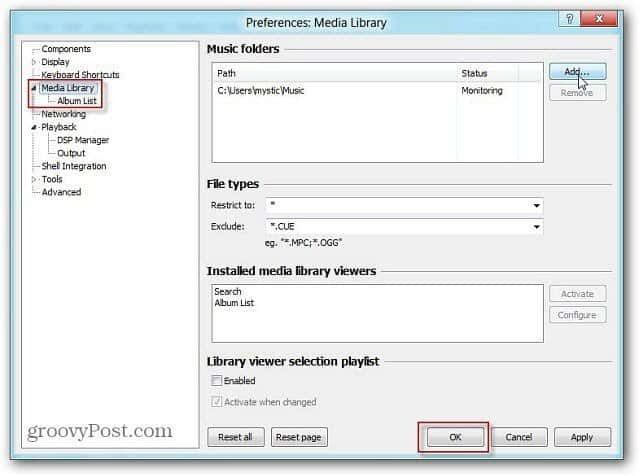 Click File >> Preferences then select Media Library. Under Music Folders, add or any path music is stored. Or remove the default paths if you music is located elsewhere. For instance here I am installing my collection of CDs I burned to FLAC files from my home server. But wherever your music resides, select the appropriate folder. After adding your music collection, I recommend the Columns UI Component. 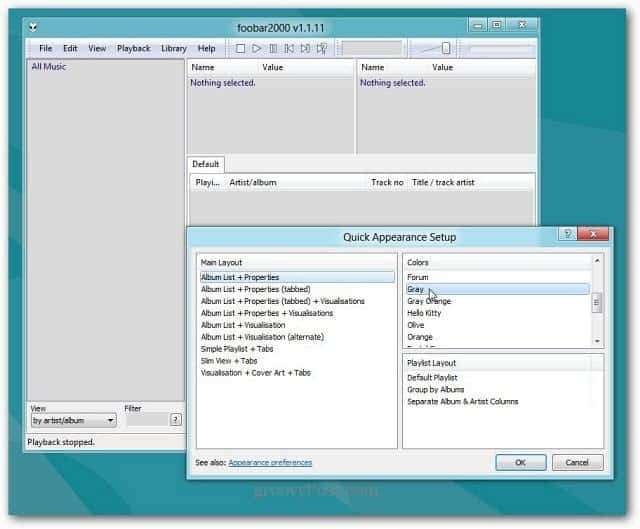 Components are easy to add to Foobar2000, and there’s a huge list of them. 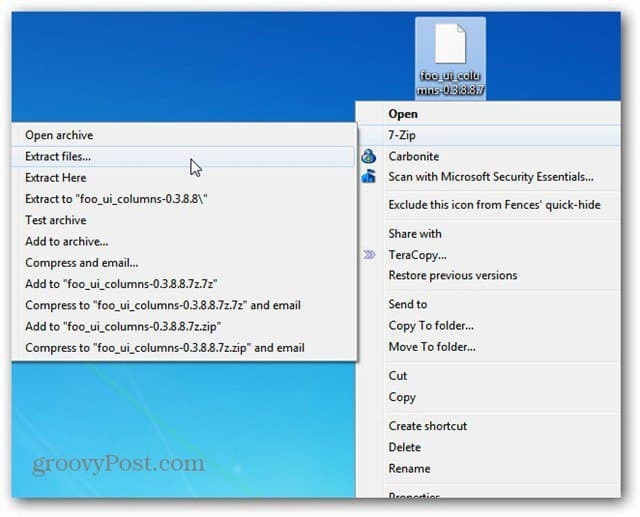 After downloading the zip file, use 7-Zip, WinRAR or your favorite compression software. Make sure you’re closed out of Foobar2000. 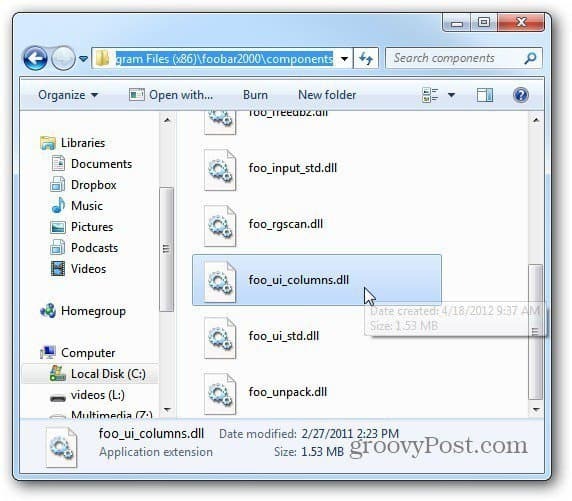 Then drag the foo_ui_columns.dll file into the Components sub directory of the Foobar2000 folder. 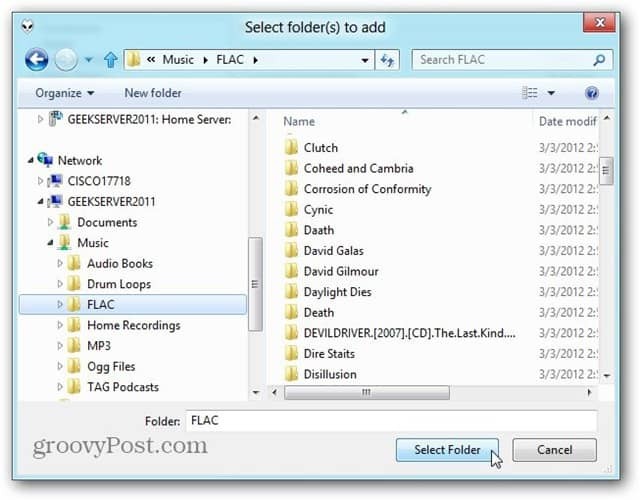 Now close the components folder and open Foobar2000. A message comes up asking which display you want. Select Columns UI and click OK.
Then you’ll see the Columns UI Quick Setup window. Just like the default interface, you can select what you want. The cool thing is you can constantly change the interface at any time. Click Library to see all of the songs from your collection and create Playlists if you want. Use the keyboard combination Ctrl+N. Then type a name for your playlist. I like to type in the band names for the albums I have. But you can name them whatever you want. Then drag the songs to that playlist. It also has a mini playback controller from the Taskbar, which is always a nice feature in a music player. It has a funny name, but essentially every aspect of the player can be customized. Another advantage is the amount of music file types it will play out of the box. It support FLAC, OGG, WAV, WMA, MP4 and others. It’s small, light on system resources, fast and will support your iPod or iPhone with the iPod Manager Component. It does take some work to get set up, but once you do, you’ll realize how powerful this player is. 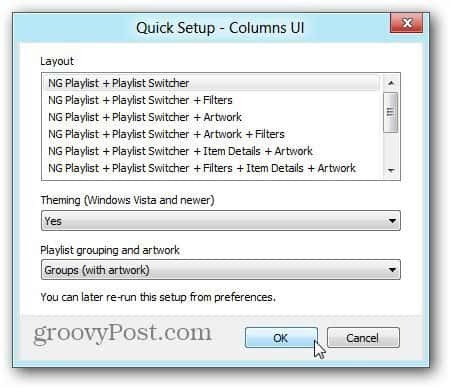 In fact, it made the groovyPost list as one of the best MP3 tagging apps for Windows. If you’re a music lover and like geeky customizable music players — Give it a try and leave a comment on your experience. All my metadata is attached through iTunes. That is PRECIOUA and is the only thing holding me hostage to iTunes. Can that be transferred to Foobar 2000, or an alternative? Can I transfer the iTunes METADATAto a different media organize-retrieval system? can the latest version be used with ipod nano 7th gen? Also, how can i save foobar 2000 on a usb flashdrive instead of the computer in order to not have to download it from the web for each computer i use?